Osgood, Charless. Nathaniel Hawthorne. Digital image. Wikimedia Commons. 22 Sept. 2010. Web. 24 Nov. 2015. 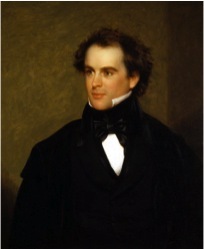 Nathaniel Hawthorne was born on July 4th, 1804 in Salem, Massachusetts to Nathaniel Hathorne and Elizabeth Clarke manning. He died May 19, 1864 in Plymouth, NH while on tour of the White Mountains. After graduating from Bowdoin College in 1825, it is speculated, that he added the “w” to his last name in order to separate himself from his ancestor John Hathorne who was the judge involved in the Salem Witch Trials. Hawthorne’s writing belongs in the Romanticism period and more specifically Dark Romanticism. This is a literary subgenre of Romanticism. It is centered on writers like Poe, Hawthorne and Melville. Typical themes in Dark Romanticism are human proneness to sin and self-destruction, human fallibility or error, and difficulties with social reform. These writing may adapt images of evil forms like devils, Satan, ghosts, Vampires and werewolves. Much of Hawthorne’s work is inspired by Puritan New England. He writes in a sort of historical fiction with common themes of sin, guilt and retribution. Early in his career Hawthorne worked as the editor for the American Magazine of Useful and Entertaining Knowledge. During this time he sent short stories, including “The Minister’s Black Veil” and “Young Goodman Brown” to various magazines and annuals although they did not draw much attention. Hawthorne did not become locally known until published his collection of short stories into one volume, known as Twice Told Tales. “The Minister’s Black Veil” was first published in 1836 in an edition of The Token and Atlantic Souvenir. Hawthorne later published this short story in Twice-Told Tales. The story takes place in an 18th century Puritan New England town. The story’s focus is on the town’s people and their reaction to the seemingly benign veil. Some main themes focus around sin and how one wears guilt. There is a never ending question of what the veil represents. “Young Goodman Brown” is also a short story that was written by Hawthorne in 1835. This short story takes place in 17th century Puritan England during the Salem witch trials. It looks at the idea that humanity lives in a state of moral corruption. Hawthorne uses “Young Goodman Brown” to depict the hypocrisy of the Puritan way of living. “The Minister’s Black Veil.” Wikipedia. Wikimedia Foundation, 29 Oct. 2015. Web. 25 Nov. 2015. “Nathaniel Hawthorne.” Wikipedia. Wikimedia Foundation, 12 Nov. 2015. Web. 25 Nov. 2015. “Young Goodman Brown.” Wikipedia. Wikimedia Foundation, 30 Oct. 2015. Web. 25 Nov. 2015. The Open Anthology of Earlier American Literature: A PSU-Based Project by Kelsey Neely is licensed under a Creative Commons Attribution 4.0 International License, except where otherwise noted.